A woman walks with a bag from the Vineyard Vines store at the Woodbury Common Premium Outlets Mall on Oct. 21, 2017 in Central Valley, N.Y.
Target hopes to lure younger shoppers by teaming up with preppy lifestyle brands. In the past, it's sold exclusive merchandise from clothing company Lilly Pulitzer, shoe retailer Toms and rain boot brand Hunter. 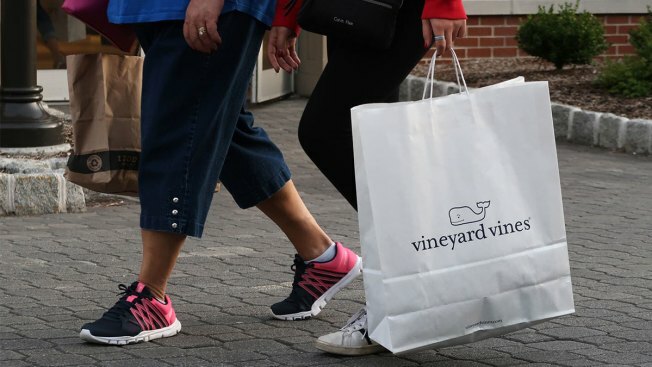 On Thursday, Target announced it will be teaming up with Vineyard Vines, best known for its shirts embellished with a logo of a smiling pink whale. Target said the limited-edition collaboration will consist of home and outdoor goods, pet gear, clothing, accessories and swimsuits. It said items will cost as low as $2 and up to $120, but most will be less than $35. Vineyard Vines will launch at Target on May 18. "Vineyard Vines is a brand that our guests know and love, and one that exemplifies our shared sense of optimism and joy through their use of bold colors and prints," Target CMO Mark Tritton said. In the past, though, there's been so much enthusiasm and build up around some of these brand launches that Target has failed to deliver. Lilly Pulitzer sold out within hours at Target stores in 2015, leaving many customers who waited in line furious. When Hunter merchandise went live at Target in April last year, many shoppers were expecting to be able to buy the brand's famous rain boots, but "production issues" led to a delay. The boots ultimately never ended up on shelves. Target can use the Vineyard Vines launch to show it's learned — or hasn't learned — from these past mishaps.